Last Week's Collaboration on Leather. Wow, I can't believe this day is finally here... what day is it you ask? Well, hump day of course (I couldn't resist), but it also happens to be the second in our blogger collaboration, and the day I leave for Paris, followed by London!!! Can it get any better? 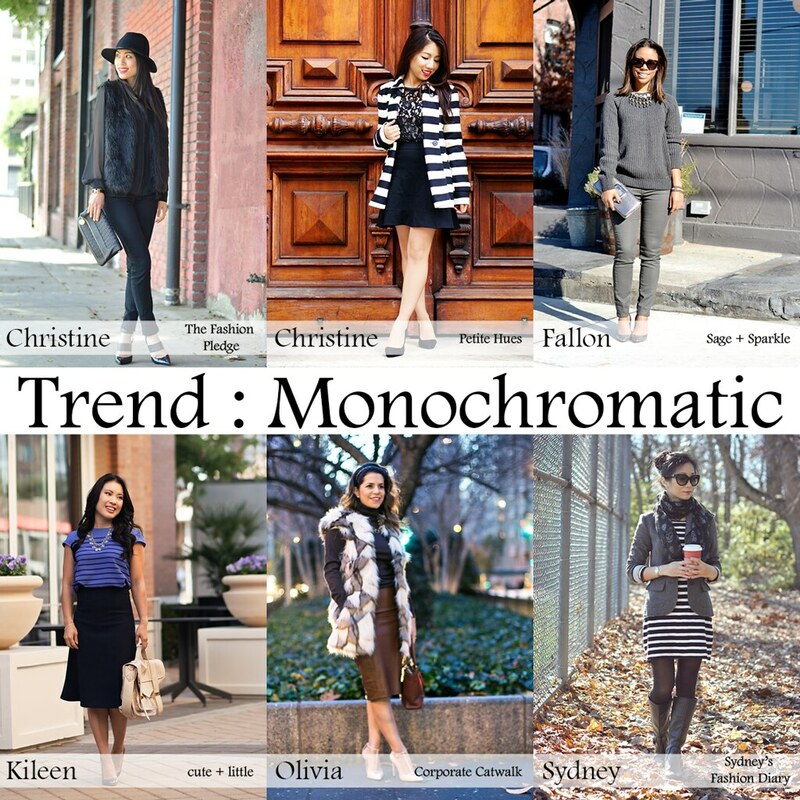 This weeks trend is focused around "Monochromatic" - which is all one hue, in tints, tones, or shades. Grey, spelled the British way in light of where I'm headed this week, is the hue I choose to represent. I really wanted to do a color that would pop, like green, or burgundy... but when it came to pulling this look together, grey seemed to be the only items I could find in my wardrobe, that was all one solid color, and not black. Nothing wrong with black, its chic, timeless, and always elegant, but I knew someone else would do it, Christine - The Fashion Pledge, and do it fabulously! So I ended up with grey. Inspired by Sydney from last weeks topic, leather, I decided to style my grey monochromatic look, day to night, but simple adding/removing accessories and changing my footwear. The result were fantastic and can easily be achieved. First up, let's take a more detailed look at the above, which is styled for night. What do you think of this trend? Would you wear it day-to-night, as I did above? What would be your go to color?